Dense Words: TES Fanfic: here it is. I actually wrote this before I wrote yesterday's blog post, which is why it sounded like the fanfic was in the post. Sorry if that disappointed anyone. Everything happened so fast the last few hours. Yesterday, I got paid employment carrying supplies over the mountains. I thought it was either smuggling or bringing secret military supplies to an outpost or something, because the guy who hired me was a thief or some other sort of petty criminal … which … I suppose … is what I am, too. We got ambushed just below the tree-line. After that things got crazy. Executions, Dragons, escape. To stand where I am standing today, I killed eleven men. Two Imperial guards. The rest were like you, at my feet. Bandits. The first bandit I met, I tried to just walk away. Leave well alone. He came after me with his weapon in his hand. I was nearly killed. Just before that, I had met the first person I saw since my escape. Friendly hunter. He sold me some food. I was not ready to fight. But I did. That fight, it got my hunting spirit roused. I ran up the mountain, and I surprised two more bandits. I didn't try to be friendly this time. The third one was on top of a ruined tower. I shot him and he fell. I don't know if my arrow killed him or the fall. I didn’t stay to find out. I wanted to know what was at the top. At the top was a sort of ancient temple. I crept around, until you spotted me. You didn’t say anything. You just shot me in the arm. It hurt. This morning, you had something. You had a sort of life. You had your two friends who came to defend you; you had this place, up here in the snow. All this beauty even thought the cold will kill you if it can. You had your own belongings, your freedom, your life. I killed your two companions. This was not easy, especially with you shooting at me whenever you got the chance. One of your arrows went through my boot. Grazed the arch of my foot. I nearly fell. When your second friend, the big elf, died, I turned around. There was a block of fallen stone between us. Looked like a dragon head. But you were on a ledge, in front of a buttress. You had nowhere to run and hide. I dropped my sword and ax, and took my bow off my back. Lucky it was undamaged. My arrows were less lucky, but I had five or six good ones. I shot you. I think you were surprised. It hit you in the gut, which is not where I was aiming but I was hampered by the rock that protected me from your arrows. Why didn’t you run? You saw your two friends die. You got shot. You could have run away. I would have let you go. You kept shooting... slower. I shot you again. This time your armour did not slow it down. It looks like it killed you right away. I wanted to ask you why didn't you run. I wanted to ask you “WHO ARE YOU?” It was too late. You still look angry, even with your eyes dead. You must have been beautiful, once. 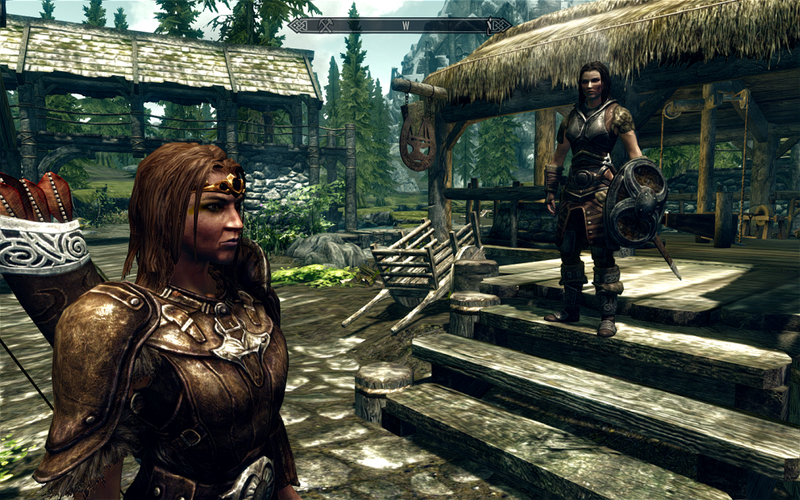 Big strong Nord girl. I was curious. I didn't come here to kill you. Well, the snowstorm it is clearing a little. So I sit you up against the wall, on your ledge so badly chosen to fight from. You can watch the view, so beautiful, while your blood freezes. So cold. I kiss you goodnight, Nord bandit woman. Your lips are cold already. Barely half an hour later, I was killing again, back in the rush of the hunt, my blood hot with joy. I think I may be a bad person.